Socks Rock brings you the highest-quality custom team socks that you can use to show your support for a team, market your business at a charity event, or wear during an important match to intimidate your competing team and boast your own unique identity. Designed to offer optimal comfort and support, our socks not only offer you all-day comfort, but promise you unmatched aesthetics and a unique style as well. Browse through our wide selection of most popular designs, pick the one you like the most, and build your own custom volleyball socks that you can wear to practice sessions, as well as during a rigorous, highly competitive match to keep your feet dry and warm! 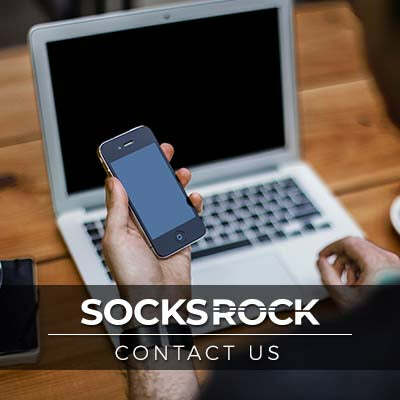 Socks Rock is a trusted and cost-competitive supplier of custom team socks. Made from premium-quality materials, our custom lacrosse socks are equally suitable for professional players and amateurs because of their excellent durability and unmatched performance. What’s more, you can use different customization options to build your own unique personalized sports socks. Here’s how you can benefit from our customization services. Step 1 — Browse through our collection and select a design that you like. Step 2 — Choose a color for stripes. For designs with thick and thin stripes, you can pick different colors for stripes with different thicknesses. Step 3 — Choose a color for the sock. This will serve as the background color; therefore, make sure that the color you choose complements the color of stripes. Step 4 — Select the right size and order quantity. Step 5 — Checkout and then sit back and relax while our experts do the work and deliver your pair of custom volleyball socks to your doorstep. Your feet do a lot of work and experience intense stress during a rigorous game of football, baseball, or any other sport. Taking good care of them is not only important to prevent sports injuries, but also to enhance your athletic performance. Socks Rock allows you to do so in style with its custom soccer socks that will offer your feet the comfort and protection they need. Individuals who play volleyball, football, or lacrosse are at a higher risk of sports injuries, particularly to their feet. Investing in a pair of super comfortable, high-performance socks is important to keep your feet protected from deep and explosive cuts and to cushion the high-impact areas. The custom lacrosse socks available at Socks Rocks have been designed keeping these factors under consideration. Perfect for young players, as well as professionals, these socks will offer your feet the protection they need on and off the field. Socks Rock — The Custom Socks Shop! Socks Rock is your one-stop-solution for all types of sports socks. Whether you are looking for custom volleyball socks or you want to buy baseball ribbon stirrups, you will find everything you need to rev up your style game at Socks Rock. What’s more, you can add an individualistic touch to your baseball team socks or any other accessories using our customization options and boast a stylish look on the field! 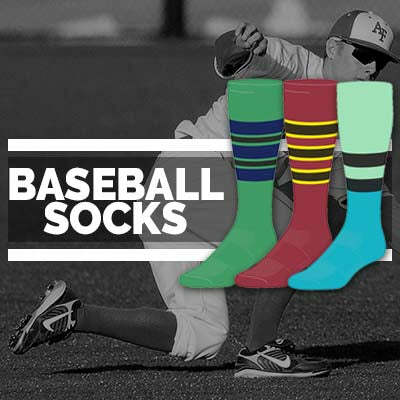 Whether you are a baseball team captain looking for customized baseball team socks or a teenager who has a passion for sports, Socks Rock has something for all the athletes. Browse through our range of sports socks and you’re sure to find a design that matches your idea of a perfect pair of sports socks.